The new full-color comic book series “Red Angel” features a redhead, chiseled beauty as its star. She might look familiar. Victoria Angel, the series heroine, was created with one knockout female in mind: luscious Amy Vitale—fitness model, actress, former wrestling diva and celebrity spokesperson. 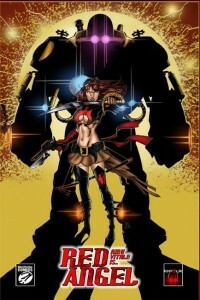 “Red Angel” is a 24-page per issue, full-color comic book series. It debuts on March 25th at MegaCon 2011 in Orlando, FL. In the series, Victoria Angel is the captain of an airship called Red Angel, whose crew is tasked with defending rebels after the Machine Wars of the late 19th century. Amy Vitale’s famous spirit, beauty and resolve captured the eye of series publisher What The Flux Comics and inspired author Erin Pyne and artist Russ Leach to create an all-new sci-fi comic featuring Vitale’s likeness. The comic series’ debut issue can be pre-ordered at http://whatthefluxcomics.com. Red Angel #1’s price is $3.75 plus tax and $1.00 shipping and handling.